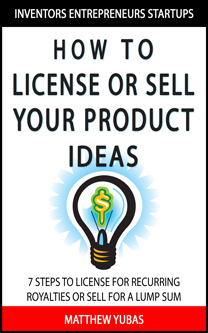 This guidebook takes you through a 7-Step process to license or sell your ideas. Based on 24 years of experience, you’ll find out the important step-by-step methods to sell your ideas for a lump sum payout or license for recurring royalties. * The Process - The 7 step process to selling or licensing for royalties and advances. * Where To Look - How to find companies, and how to approach them so you don't get rejected. * Making Contact - How to contact companies, getting the right person on the phone, what to say, and not to say (includes a phone script). * Company Interest - What to do when a company is interested. * Negotiating a Deal - The process to negotiate a deal and create a win-win outcome. * Royalties - Learn how much royalties you can earn, possible advances, and getting companies to pay for patents. * Agents and Consultants (Product Scouts) - How to work with Agents, what they expect, and where to find them.